The wind breezed across the opened window, though it hit my face it was not unkind. The weather was getting a bit chilly as it was nearing the end of the year, it was November to be precise. My brother had been having a sullen mood since we left our house, he was the one to blame for sleeping late the night before. I have told him million times to quit his habit of playing games until dawn but he just never wanted to hear me. I could not stand his whining, he had been crying nonstop for the past two hours it was actually starting to give me a massive headache. In the process, I noticed the car was not going to the usual road we passed, it was unusual for my father to go off track. If anything, my father was the best navigator ever exist and I took pride of it. ‘‘Dad, are you sure we are getting on the right way? Because the last time we were here, there hadn’t been this kind of building around here?’’ I asked my father who was driving while my eyes had not stopped examining the foreign road. He was a bit startled with my question I could tell from the way his brows furrowed in uncertainty. I knew my father was not in his best condition that day, he had just landed in Jakarta a night before, but we could not miss this family gathering. He was indeed restless and my crying brother did not help at all. I felt bad for my father, but really I hadn’t got the chance to learn how to drive. ‘‘I’m not sure? I probably might have messed a few turns earlier,’’ after a solid of fifteen minutes, my question was not left hanging in the air anymore. If my father got to choose the wrong path then the restlessness was already so unbearable. I pinched the bridge of my nose and leaned back into my seat. I wanted to help but I could not and it was a terrible kind of hopeless feeling I felt. Another fifteen minutes had passed and nothing was happening, the car was still stuck in a traffic out of nowhere. Being stuck in a traffic felt awful, moreover stuck in a traffic on the wrong road to our initial destination. I sighed in both annoyance and relieved when I saw my brother eventually fell asleep after his hours of crying show. At least the prior cause of my headache was getting out of the way. I was about to get some sleep as well, but my mother’s voice ringed through the silence of our car. ‘‘We need to have lunch first,’’ said my mother while she handed me her phone which had already opened the Waze application. It showed up a restaurant’s location. I have grown to think that maybe that’s the thing about a mother, they’re all very demanding that I had no other choice left but to complied her. I peeked at my brother who was snoring not so lightly, he was a loud sleeper. However much I hated him for his mischievousness when he slept all I did was watching him and cooed him internally. I fixed his sleeping position to a more comfortable one, he liked it better to put his head on my lap so I did it accordingly his liking. The Waze sound made me look up to the phone screen and almost in immediate I turned it off, I hated the sound so much it was annoying. It was still six kilometers away from the restaurant and eight meters away for the next direction, so I took my time to put my attention on the road outside. Although it was almost December, it was still pretty humid there. Maybe it’s true when they said Bekasi was really located in outer space because strangely enough it felt like one, by the constant humid weather and all the never ending traffics. The road was neither foreign nor familiar enough for me that’s when I realized my father really did get lost earlier. I couldn’t believe I let this happened, usually when my father was not in his best focus I would be his maps. However this trip we both messed up. Twenty minutes later we have reached our destination, not the place where my mother would held the family gathering but the one where my mother wanted to have a lunch at. It was a seafood restaurant, the name of the restaurant was Saung Wulan. When we first entered the gate, I must admit the place was not much different with any seafood restaurant out there. The parking lot was quite packed, only leaving one spot for our car. From the parking lot, we could see there was a huge pond at the right wing of the place and a building on the left wing that I supposed was the restaurant. Turned out that the day we visited the restaurant, it was booked for a wedding. The wedding did not take place in the entire area of the restaurant, it was held at the building. So we came inside to other side of the restaurant that had a big pond as its view. We scanned the place in order to get ourselves a table to sit. We found one for ourselves near the pond, not the best one of the place obviously. Not because it was near the pond, but because it was so crowded that my mother was afraid my brother would do something that would harm himself and the others. We decided to find another one for ourselves on the other side of the restaurant. What irritated me was the fact that no waitress seemed to welcome us. I knew they probably were busy, but weren’t they supposed to assist us as their guests? At least until we find ourselves a table to sit. My disappointment was a bit washed away when there was a waitress coming to our way and they told us they had one available table for us. However, the table was put a reserved sign on it. ‘‘Are you sure we can have the table because it clearly said someone else has already booked it?’’ I asked the waitress before we got to sit. I needed to make sure they wouldn’t going to put us into trouble. ‘‘You can have it, they are late by an hour or so anyway, I think they aren’t coming,’’ with the waitress’ confirmation then we took a seat at the table and began to screened through the menu. Not long after we ordered, my brother was already playing with the kids around. It was not uncommon for him to befriend with strangers in such a brief moment, he was a social butterfly after all. Another waitress was coming to our table, I was almost amazed at how fast they served our orders. But my thoughts were quickly torn apart, the waitress was not coming to get us our foods but rather to kick us away from our table. Turned out the previous customer was coming and we had to leave because they said it was their places. I was really in a lost of words, I was furious. I couldn’t believe what the waitress did to us. They were the one who offered us the table and yet they kicked us away the table because the customer was present? This was the worst service I had ever gotten from a restaurant. Terrible service wouldn’t stop right there, after they kicked us away they left us and did not even make any attempt to find us another table. What kind of restaurant it was. Weren’t they trained how to treat the customers? 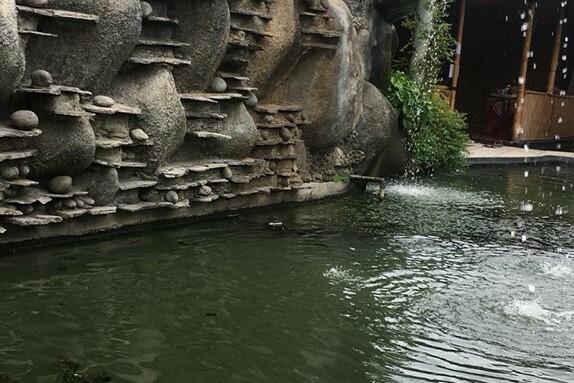 The worst of the worst happened when we decided to get out of the restaurant, one of their waitress bumped into my brother and that made him slip into the pond! That was really, really, really sickening. Although the pond was not deep enough to drown my brother, it still made all of his clothing wet. When my father took him out of the pond, all the attention was on us for the moment. However, when I thought we had the worst day in the restaurant, it did not stop there. Not even one person in the restaurant offered us a hand, even the staff were too ignorant to spare us a glance. Because of my brother’s accident, my mother enraged and she strolled toward the staff room to complain about the service. But, again, they were only sorry half-heartedly. They did not even give a towel to my brother. From then we promised to never come to that place ever again. That was not even bad service, that was horrible. Very horrible.